Available as low as $15.99 per bar over spot! When it comes to using precious metals as an investment vehicle, gold, silver, and platinum bars are often preferred by many serious investors. Bullion coins are increasing in popularity, but it is still hard to beat the value of gold bars in particular. 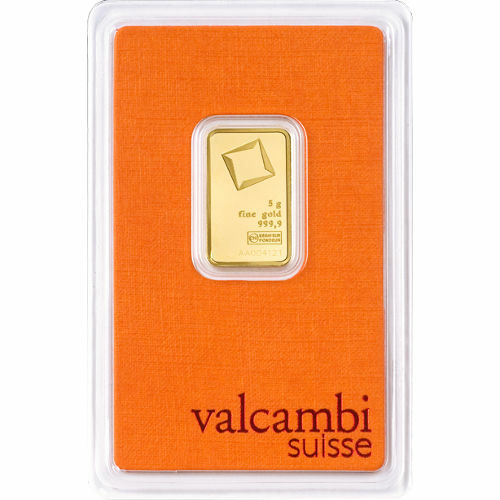 Right now, the 5 Gram Gold Valcambi Bar is available on Silver.com as an all-new product. Arrives in a blister-proof plastic package. Includes an individual serial number. Valcambi Suisse orange Assay card inside packaging. Consists of 5 Grams, or .1608 Troy ounces, of .9999 fine gold. Reverse features the Valcambi Suisse name. Obverse bears the mint logo, weight, metal content, and purity. Bullion coins are popular with many investors because they offer smaller weights and intricate designs in a quality investment product. The problem that most investors face is an inability to either procure these items due to high demand, or inability to afford them because of the higher premiums associated with bullion coin design. Sovereign mints produce the vast majority of gold coins in the world today, and the production process is long and complex. Add to that the fact that mints don’t often sell direct to consumers, and high premiums over the spot price of gold are added to the price. In some cases, limited mintages make it even harder to procure these products. 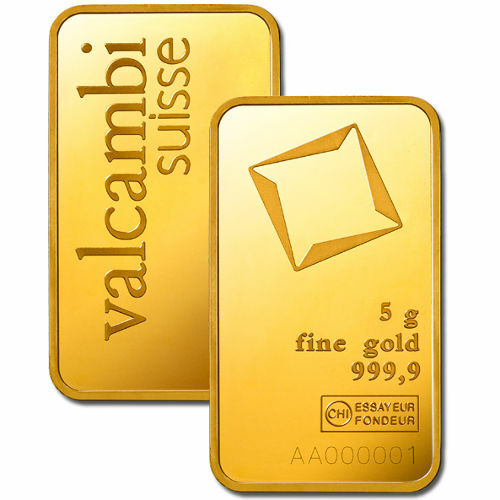 5 Gram Gold Valcambi Bars have no mintage levels assigned to them, making it easier to find quantities to purchase. On top of that, while the minted ingot production process is more complex than a cast bar, the products are still more affordable than bullion coins. On the obverse of each 5 Gram Gold Valcambi Bar you’ll find the image of the rotating square logo of the mint, along with the engravings of the bar’s weight, metal content, and purity. An individual serial number is included along the bottom, which features 2 letters and 6 numbers in its code. The Assay card that arrives with your purchase includes this serial number as verification. The reverse of Valcambi bars features only the refinery’s name. This is situated along the lefthand side of the bar’s reverse face and features the full name of “Valcambi Suisse.” Each of the bars in this Silver.com listing is a new product from the mint, and arrives in pristine condition inside its blister-proof plastic packaging. Valcambi Suisse opened in 1961 as Valori & Cambi. The refinery struggled through its first decade of existence, but the purchase of the company by Credit Suisse in 1968 changed the fortunes of the business for the better. Please don’t hesitate to reach out to Silver.com customer service if you have any questions. You can reach us on the phone at 888-989-7223, chat with us live online, or email us directly. You can also compare this gold bar to others in our selection by visiting our gold bar section.